Pre-order now for February 2018 publication and shipping. The first 250 copies of The Plague of the Zombies 1966 Ultimate Guide are signed by the authors and come with a FREE art print! The Plague of the Zombies Ultimate Guide evokes the brochure you might have bought at the cinema in 1966! 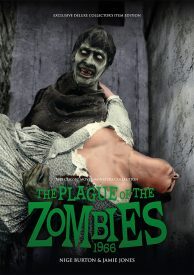 There’s something unsavoury afoot in the Cornish tin mines, and the local graves are worryingly empty – it can only be The Plague of the Zombies, Hammer’s treasured, and only, journey into the world of crumbling reanimated corpses. Our full-colour Ultimate Guide celebrates this hugely atmospheric movie, taking you right to the heart of the action. This lavish, moody publication explores the making of the movie, as well as telling the stories of the cast and crew. From stars André Morell, Diane Clare and John Carson, through to director John Gilling and composer James Bernard, you’ll meet the many creative minds who brought this eerie tale to glorious un-life. There’s also a wealth of facts and trivia, behind the scenes information and much more; and naturally, it’s all illustrated throughout with superb and rare stills and posters. Any fan of Hammer Horror will adore this unique full colour guide to The Plague of the Zombies, presented to the highest quality as only Classic Monsters know how. 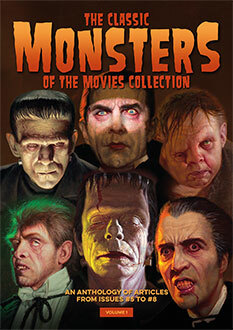 This collector’s item will grace the shelf of any self-respecting horror aficionado. The first 250 copies are signed by both authors and come with a FREE The Plague of the Zombies art print. Plague Of The Zombies is one of the most Anticipated Issues that I have been looking foward to for a long time. This Issue is fascinating to read, espcially the story about John Trevelyan the Censor at the BBFC, who objected to the Decapitation of Zombie, Alice Mary Thompson, played by Actress Jacqueline Pearce. The Film has a lot of Atmosphere, and dark overtones, which makes Plague Of The Zombies stand out from the Hammer Vault so to speak. Plague Of The Zombies is well written, by Jamie Jones & Nige Burton, and it is Beautifully Presented, with great pictures from the Film, and with amazing facts and trivia, make this one of the Best Ultimate Guides yet. I hope Classic Monsters do a Ultimate Guide on The Gorgon, another Hammer Film that is one of my Favorites. Well done to the Whole Team. Another beautifully designed magazine full of stunning photographs and insightful comments. One of my favourite Hammer films.